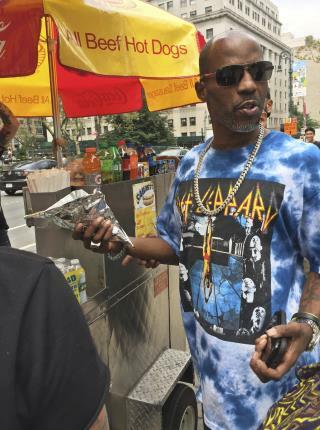 (Newser) – A judge heard a DMX rap song before adding his own lyrics to a court proceeding on Wednesday, ordering the rapper imprisoned for a year in a tax fraud case. Federal Judge Jed Rakoff took requests Wednesday, accommodating DMX's desire to hear his hit "Slippin'" before DMX faced the music over his admission of guilt. The judge called DMX's fraud a "brazen and blatant" crime that could not go unpunished, the AP reports. The 47-year-old rapper, known to law enforcement and the courts as Earl Simmons, has been incarcerated since his bail was revoked in January. He sobbed during the proceeding as his lawyer, Murray Richman, recalled his nightmarish childhood. Richman said DMX has been a model prisoner. Still, prosecutors sought five years in prison for him, citing a lengthy rap sheet and drugs. Richman wanted him free to support his 15 children and pay back more than $2 million in taxes. As "Slippin'" played in the packed courtroom, DMX nodded his head slightly to the beat while some of his supporters nodded more enthusiastically. Given a chance to speak, he said he knows taxes need to be paid and what he did was wrong. "I wasn't following the rules," he said. "I was in a cloud." The judge said that in the court's view DMX "is a good man." "In many ways," the judge said, "he's his own worst enemy." Some black folks don’t like to pay taxes because it’s a slave tax. If he makes more and more money than the average Afro-American, how is it possible he can’t pay up the government? A year in prison to nothing to these sub humans. He'll be a celebrity and live like a king. That's a joke to people like him.